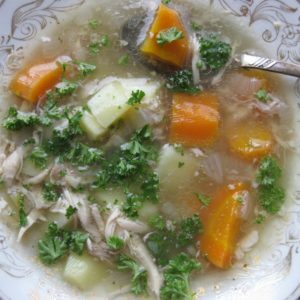 Alisa from Paleo in PDX had an amazing chicken soup recipe recently, and it inspired me to post my chicken soup recipe that The Ukrainian taught me. This soup is a staple meal in our household, and is loved by two out of three family members*. It’s especially good this time of year when the days are short and grey and nothing sounds better than curling up on the couch with a good book and a fuzzy blanket. And if you’ve got a sickie in the house, make this for them and I’m sure they will perk up soon! I had never attempted “real” chicken soup before I came to Ukraine. I always thought it would be a lot of trouble, but it’s far more simple than I imagined. Boiling the chicken in the water kills two birds (heh heh) with one stone: it cooks the chicken, leaving it moist and tender, and creates a flavorful broth. This method is more or less the same as what the Ukrainian taught me, with a couple extra twists to make it my own. Because, as I’ve said before, I can never follow a recipe without tweaking at least a few things. What can I say? I have a rebellious streak. 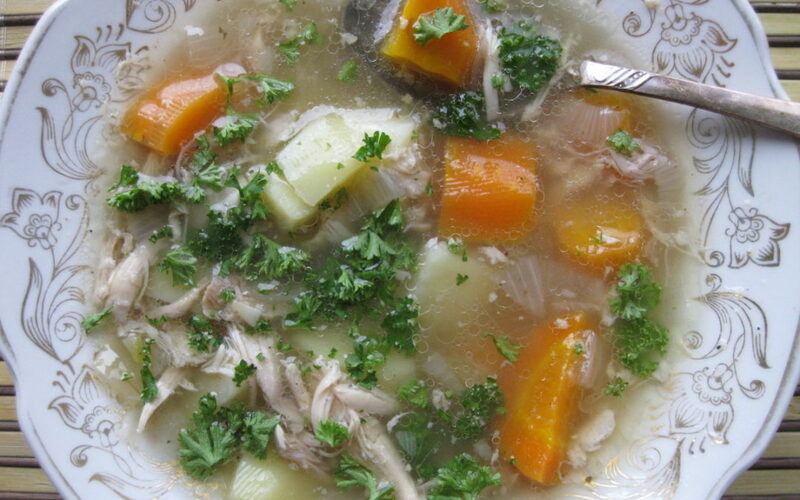 So, here’s how to make homemade chicken soup! First, start with just the basic chicken broth. For the broth, if I have chicken bone broth on hand, I’ll use it for the extra boost of vitamins and minerals, but if I’m just after a quick soup I use this method to make the broth. Put all the ingredients into a large pot. Fill up the pot to about three-quarters full with water, enough to cover the chicken, and stir to dissolve the salt. Slowly bring the pot to a boil. As the scum (I seriously have an unnatural aversion to that stuff -- blech) rises to the top, skim it off. Once it’s starting to boil, turn the heat down to low and let it simmer for about twenty minutes. While it’s boiling, you can prepare the other vegetables. If you wish, you can drink this broth as it is and shred the chicken meat to use for all kinds of things, like tacos or omelettes. Or, you can use it now to make soup! *I usually use two drumsticks attached to the thigh. So two drumsticks and two thighs. But you can use any part of the chicken you want. Add the potatoes, carrot and onion into the pot and bring to a boil once more, again turning down the heat to low so that it is at a simmer. While the vegetables are cooking and after the chicken has cooled slightly, shred the chicken meat with your fingers. When the vegetables are soft, add the chicken back into the pot and give it a good stir to mix everything together. Ladle the soup into bowls or mugs and top with a good sprinkle of chopped parsley. Enjoy! Side note: Soup is probably Little Ukrainian’s least favorite meal. He’ll eat pickled herring and raw garlic until the cows come home, but put a bowl of soup in front of him and he will nurse the thing for an hour and a half before he finally finishes it. Thanks for the shout out and kind words, Rosemary! I’m so glad my soup inspired you to create a version of your own. It sounds and looks wonderful!